RGB display. The image subset shown above is a "data fusion" of a scanned AGFA color negative image with ~10 cm pixel (GSD) spatial resolution and a hyperspectral airborne image scene with ~ 0.5 m pixel (GSD) collected on March 21, 2011. Weathered oil is visible in the coastal littoral zone and marsh area (A) in the Northern Gulf of Mexico. 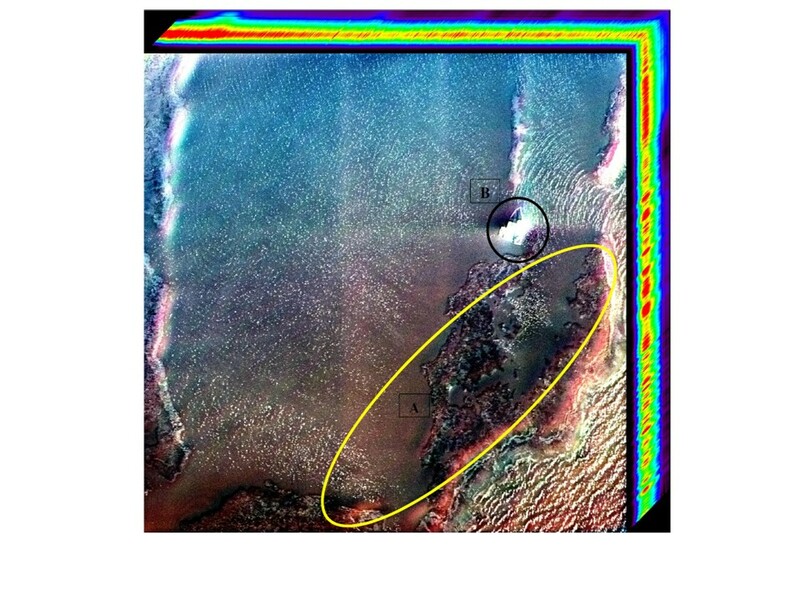 A restoration surface vessel (B), not observable in the raw hyperspectral image is visible in the fused hyperspectral image collected by Dr. Bostater, Marine & Environmental Optics Laboratory.